Pour an extraordinary cocktail, set out some irresistible nibbles, and you’re ready for a celebration. My search for the perfect New Year’s Eve libation this year led me to the “PDT Cocktail Book,”: by Jim Meehan (Sterling Epicure, 2011). Illustrated with Chris Gall’s colorful woodcut engravings, the book is an engaging and often esoteric guide to the artisan cocktails created for the speakeasy-style Manhattan bar, Please Don’t Tell. It’s such a hit that I couldn’t find a hardback version anywhere so I downloaded the e-book version. Meehan is known as one of the most innovative mixologists in a new generation of gourmet bartenders. He builds his drinks from an impressive stock of unusual and hard-to-find ingredients. Just hunting down all the components is a challenge, as writer Jeff Gordiner recounted in the New York Times earlier this month. We couldn’t track down many of the special spirits and mixers Meehan specifies for his cocktails but we substituted the best ingredients available in local stores. The results, if not absolutely authentic, were always impressive, with a complexity of flavor rarely found in home-mixed drinks. The cosmopolitan made with Hangar One Buddha’s Hand Vodka, which is distilled nearby in Alameda, was a perfect balance of citrus and tart cranberry flavors with just a touch of sweetness. Meehan gives credit to Cheryl Cooke of Miami, Fla. who is believed to have created the first cosmo in the mid-1980s. To complement the cosmo, I’ve been playing around with a new cracker recipe combining the Southern classics of pimento cheese spread and cheese straws. I’ve added minced pimentos to the usual sharp cheddar and ditched the cookie press in favor of a simpler slice-and-bake shaping technique. The dough can be stored in the freezer and baked off at the last minute. 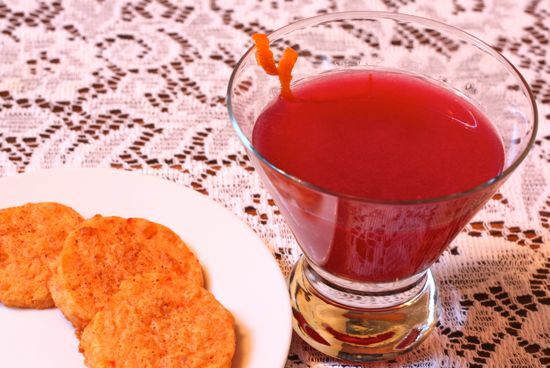 With this cocktail in your glass and these crackers on your plate, the prospects for 2012 will look very good indeed. Whisk together the flour, sea salt, and cayenne in a small bowl and set aside. Grate cheese in a food processor fitted with a medium grating blade. Transfer cheese to a medium bowl and switch to a metal blade in the processor. Add pimento and pulse a couple of times until pimento is very finely minced. Return cheese to processor and add butter, cut into 5 or 6 chunks. Process until mixture is very smooth and butter has been thoroughly incorporated. (You may have to stop the processor several times to scrape down the sides and break up any large clumps if the butter and cheese are too cold.) Add flour mixture and process, scraping down sides of bowl when necessary, just until flour disappears into the dough. Turn dough out onto a large piece of plastic wrap and use the wrap to bring the dough together into a ball. Divide dough in half and shape each half into a log about 1 inch in diameter. Wrap logs tightly in plastic wrap and freeze for at least 2 hours, or until hard. Before baking, line a cookie sheet with parchment paper and preheat oven to 400 degrees. Unwrap a log of cheese and cut crosswise with a sharp knife into 1/8-inch slices. Place slices onto baking sheet, placing them about 1 inch apart. Bake until dry in the center and golden brown around the edges, about 10 minutes. Place baking sheet on a wire rack and allow crackers to cool completely before transferring them to an airtight tin. Although crackers will keep for about a week in the tin, they’re best when freshly baked. If crackers soften in the tin, crisp briefly on a baking sheet in a 325 degree oven before serving. I’ve been saving the syrup from cooking cranberries, and was thinking it would make a fine cosmo – I’ll just leave out the simple syrup. And I do believe I’ll have a hand at those crackers too this week. Mmmmm! Your recipes are wonderful, Aleta! We made cheese straws for Christmas. Bought a cookie press and managed not to break it the first time out.